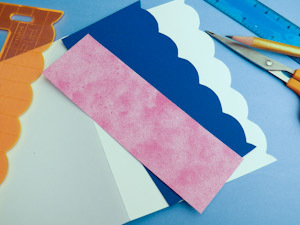 In this greeting card tutorial learn how to make a fancy edge on your handmade greeting cards using scallops and a paper punch. 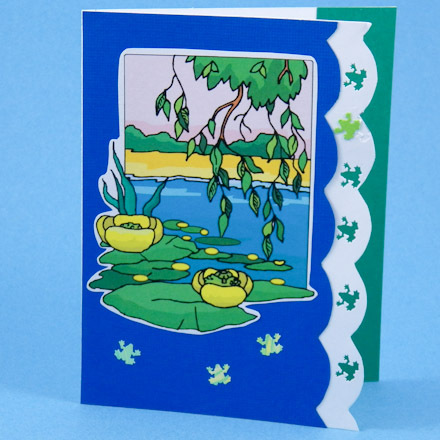 This is a quick and easy way to add a strong design element along the right-side or bottom edges of your card. This greeting card tutorial builds on the previous tutorials in the original Greeting Card Class set of tutorials. If you are new to card making, review these tutorials for ideas and basic techniques. 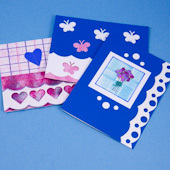 Refer to Card Class Tutorial #1: Four Patch Cards for how to make card blanks and envelopes. Unfold the card blank and lightly mark the center point (2¾") on one of the 5½" sides. Using a ruler or template with 1" scallops, trace a line of scallops along the 5½" edge using the center mark to align the scallops evenly—left and right. Cut along the traced line, then erase any remaining pencil marks. Repeat on the piece of colored cardstock. Tip: Vary the look of your cards by making the scallops exactly on the edge or up to ½" in from the edge. Project extras: Download Aunt Annie's printable scalloped edge rulers template to make your own scalloped edge ruler. Or for a different edge look, use Aunt Annie's printable wavy edge rulers template to make your own wavy edge ruler. 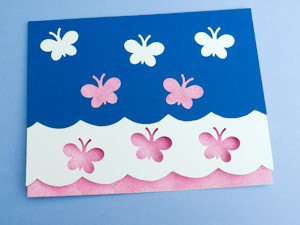 Cut the colored cardstock with the scalloped edge such that it is 2½" to 3½" wide. The width depends upon the size of your paper punch. 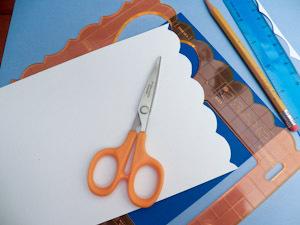 Cut a strip of the same cardstock, or a coordinating piece of paper, that is 1" to 1½" by 5½". 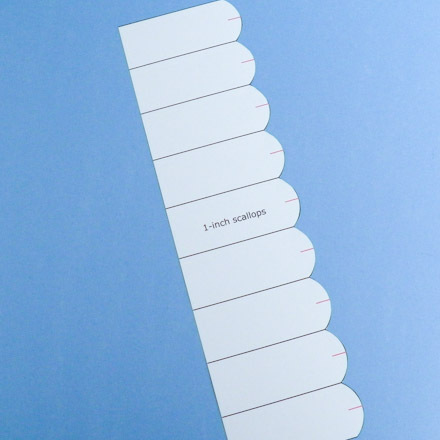 Using the paper punch, make several punches along the edge that are spaced evenly. 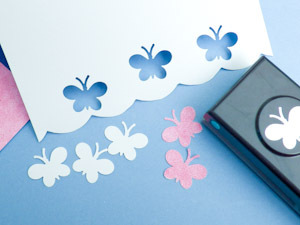 Tip: Keep the punches to use in decorating the card or envelope. You might also make additional punches from the colored cardstock and/or coordinating paper. 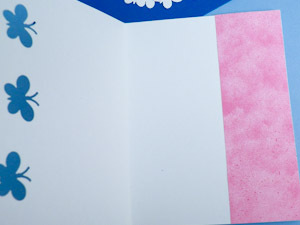 Glue the colored strip of cardstock or paper inside the card. Align it to the straight 5½" edge. Tip: This strip of paper backs the scalloped edge and punched holes when the card is closed, so it is important that there is a strong contrast between the card's color and the strip's color. Glue the scalloped cardstock to the front of the card, aligning it to the folded edge. Decorate the card using the paper punches from Step 3 or stamp a 2½" square of white cardstock and color it with markers or colored pencils. Get creative: Mix it up with two or more paper punches. Use the scalloped edge treatment on any card design. 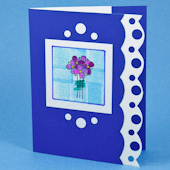 Tip: Create a lacy-look with hole punches in various sizes. This card was made using a standard ¼" hole punch and a ½" hole punch. 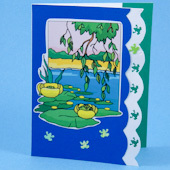 Tip: A scalloped edge is a terrific way to make a Clip Art card standout! 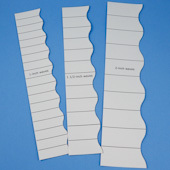 Tip: Print Aunt Annie's scalloped edge rulers template to make your own scalloped edge ruler. Or wavy edge rulers template to make your own wavy edge ruler. Tip: Make a wavy edge as an alternative to a scalloped edge.